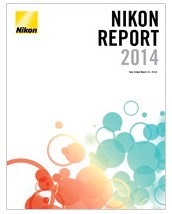 Somehow I missed it when it came out (October 7th), but Nikon has issued its 2014 Annual Report. For those that follow Nikon, this particular annual report is of interest because it represents the first statements of the new management team, headed by Kazuo Ushida. From the early pages, this report has a different tone than previous ones, at least after you get through the first few pages of history-worship and raw financials. "Until now, Nikon was grounded in the idea of using its own technology to develop, manufacture, and market products, so it employed a hardware-oriented strategy. In this rapidly changing business climate, however, establishing distinction in hardware alone has its limits. We thus perceived a need to add application software to the hardware that has been our mainstay to evolve into a solutions-oriented business model and sustain growth in the future.” I don’t disagree with this notion. As I’ve pointed out for some time we need more attention to software. The question is how much of this Nikon can actually do on its own. The quoted statement is shortly followed by “we must not attempt to undertake everything on our own,” so at least on paper Nikon seems to understand that they really don’t have a lot of core competence at software at the moment. “Now everyone, including children, enjoys taking and sharing pictures [due to smartphones]. Simply put, we have ever-widening latent demand [for imaging] at hand. Our task is to discover how users may take advantage of our products and services. The Imaging Products Business has sown various seeds, including product development of new concepts. At the earliest, these ideas may begin to contribute to our profits from the fiscal year ending March 2016.” I personally endorse this way of looking at the problem of smartphones. Change always promotes potential gains, if you can find them. But note the word “services” in the text. Would that be things like Nikon Image Space? If so, that ship has sailed out from under Nikon, I believe. Nikon simply can’t be competitive in the cloud given that Amazon, Apple, Google, and Microsoft are amongst the ones already there and pushing it hard. Put another way, I can’t imagine a Nikon service that would generate any significant revenue next year. “Our products must be implicitly trustworthy.” [Nikon’s new philosophy statement is “Trustworthiness and Creativity.”] Okay. Umm. Yeah. It seems to me I’m still getting D600 dust email complaints of various kinds (“didn’t replace my body,” “still generating dust,” etc. ), so Nikon needs to get working a little harder on this one, I think. It’s not just good enough to make trustworthy products in the future, you also have to repair loss of trust you generated in the past. The core way Nikon proposes to “strengthen the core Imaging business” is, wait for it: “Improve profitability.” You can probably guess where that leads in the next graphic: “cost reduction.” Note that up to this point we were supposed to add software and services. Now we’re supposed to cut costs. There’s a basic conflict in those top-down directives that isn’t resolved elsewhere in the Annual Report. The strategic goals for Imaging were stated as: launch innovative new products, introduce a new marketing strategy, gain new depth and new exposure in emerging markets, and yes, cut costs from development at every stage to sales” (my emphasis added). I’ve written before that Nikon has to eventually transition DSLRs to mirrorless simply because of costs. This is just one more indication that’s going to happen. Note that while Nikon doesn’t expect sales of Nikon cameras and lenses to be higher in the current and coming year, it does expect profits to be higher next year. Significantly higher. This is labeled under “Management Targets.” In other words, it’s one of the key metrics that Imaging managers are going to be measured on. Not customer satisfaction or unit volume, mind you, but simply profit. That’s a bit of a stretch, I think. Imaging already has a GPM of 10% or so, which is good for a consumer goods maker. Here’s the line that particularly bothers me (also from Gokyu-san): “As technology has matured, our products themselves can no longer be as distinct. Consequently, price wars are becoming fiercer, making it essential to continuously and thoroughly reduce costs to maintain a profit.” Failure to lead and innovate is the real problem. It’s statements like Gokyu-san’s that are going to give everyone the impression that Nikon Imaging is a cash cow that just needs to be milked. Milking as a strategy rarely works for long in the consumer electronics industry. Indeed, it makes you more vulnerable to ending up with dead cows. Nikon needs to figure out how to make distinct products, period. “The first strategy is to generate market activity by introducing innovative products. This may involve working with other companies.” Wow. Essentially an admission that Imaging can’t innovate on their own, and note the contradiction to the previous statement. Nikon Imaging is moving to weekly planning of manufacturing. Note that Apple is currently on hourly management of manufacturing. I could go on forever on dissecting different parts of the Nikon Annual Report—plenty of other gems lie within—but I’ll leave some for you to discover. I encourage you to read report, especially the President’s statement up front and then Gokyu-san’s Q&A on the Imaging Business Unit. The whole annual report reads very much like a business school example of absolute top-down management. The problem I see is that while throughout there’s a common theme of solving customers’ problems—which is typically a bottom up process—top management isn’t actually all that much in touch with customers, but the lower end of the organization is. The only way the report mentions they’re dealing with that is database mining.